Approx. 3/4 inch in thickness. 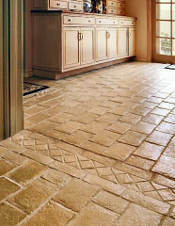 Finishes vary greatly - smooth, stone pattern, sandblasted, etc. The concrete is anything from regular aggregate concrete to various mixtures of light weight aggregates. 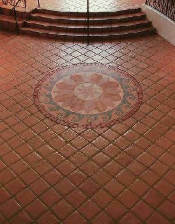 One production process is called Encaustic tile and is treated the same as all concrete tile with our products. However, test carefully before sealing. Some manufacturer's use mold releases that can create blotchy finishes. Look for manufacturer to say to wash the tile before sealing as a clue. 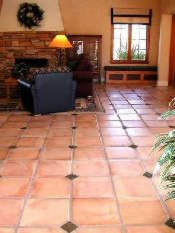 A concrete tile (cement tile) can look exactly like a clay tile or a natural stone. Or, just about anything else. This is one of the advantages. Concrete can look like almost anything. This also causes confusion about what you really have on your project. See the acid sensitivity test to confirm if you have a clay or a concrete product. Note that removing grout residue from the grouting process with acidic cleaners (even ours) can cause etching of the surface unless done with caution. Using our Grout Easy product before grouting can be highly beneficial for ease of cleanup. The manufacturing process for concrete tile varies from dry pressed by machine, to wet cast in molds, to extruded by machine. As with anything of concrete, the color options are many. It is usually colored with iron oxide pigment at the surface, or throughout the mixture. Further "Items of Interest" for this surfacing, and all others, are at the bottom of this page. If your tile comes from the distributor already sealed, it is treated very differently. See the Surface Types page for "Factory Sealed". Below are not Mexican Saltillo tile. They are concrete tile. Traditional old world beauty | Creates a rich, soft feeling | Many choices for sealer finish gloss level - from none to high gloss | The right sealer can also make it more durable. * Should not be needed after using Grout Easy. Use caution to prevent etching with Grout Residue Remover. #2. If the Concrete Tile is grouted, but never sealed. * If you have old grout smears. Use caution to prevent etching with Grout Residue Remover. #3. If the Concrete Tile has had a sealer applied in the past. * If, after stripping, you find old grout smears or crystal efflorescence from years ago. Use caution to prevent etching with Grout Residue Remover. 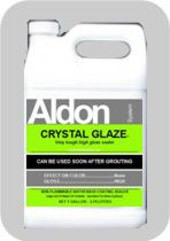 ** If your grout is badly stained. Regular stains are usually removed by the stripping process. Note 1: A water drop absorbs immediately (at arrow). If this does not happen on your tile it is either some other material that looks like a Concrete Tile and needs to be treated differently. Or, it might have been sealed at some time and you should review this page. Note 2: Some batches of Concrete Tile will be much more absorbent than the average. This only means it has an even greater need for the sealer to penetrate deep down to make it more durable. 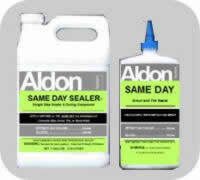 "Same Day Sealer" on Concrete Tile. This sealer is Water Base | Penetrating Type. Provides: No color enhancement or gloss. Coverage guidelines (depending on absorption) 250 to 600 sq.ft./gal. "Crystal Glaze Sealer" on Concrete Tile. This sealer is | Water Based | Coating Type. Provides: little or no color enhancement and high gloss. Coverage guidelines (depending on absorption) 350 to 600 sq.ft./gal. 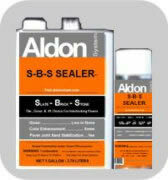 "S-B-S Sealer" on Concrete Tile. This sealer is | Solvent Base | Penetrating Type. Provides: color enhancement | low gloss | strengthening | efflorescence barrier. Coverage guidelines (depending on absorption) 150 to 500 sq.ft./gal. "Porous Stone Sealer" on Concrete Tile. This sealer is | Solvent Base | Penetrating Type. Provides: color enhancement | medium-high gloss | strengthening | efflorescence barrier. Coverage guidelines (depending on absorption) 150 to 400 sq.ft./gal. 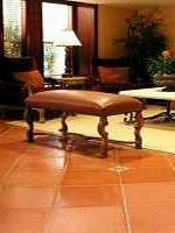 Easy Care Products: for a Concrete Tile floor. "Maintain" - for no streak wet mopping of Concrete Tile and all other types of flooring. You may have heard of concerns about Concrete Tile. All of them would be prevented with the information we provide here. Therefore, you can have the floor you want!